Many risk reduction strategies have been identified throughout the years. Although they are important to recognize, they alone do not prevent SIDS. Even when these strategies are strictly followed SIDS can still occur. Risk reduction strategies attempt to reduce stressors that work in tandem with the underlying biological abnormality in a susceptible infant and lead to SIDS. While stressors can be reduced, some can never be fully eliminated (e.g. infection). Baby’s Breath focuses on advocating for research to help discover, screen and treat the underlying biological abnormality responsible for sudden infant deaths, while supporting families impacted by a loss. Until we better understand the causes of SIDS, families should follow current risk reduction strategies to help reduce the risk of a SIDS death. Always place your baby on their back to sleep for all sleeps (nap and night time) on a flat and firm surface. It is very important to place babies on their backs to sleep immediately after birth. Make sure to tell everyone who is caring for your baby that they should always place your baby on their back to sleep. At about 5 months of age, many babies begin to roll from their backs to their tummy. Once your baby starts rolling and choosing their own sleep position, you don’t need to keep turning them over onto their back. Your baby will need to spend supervised tummy time every day soon after they are born. This will help develop their neck muscles and prevent plagiocephaly (flat head). Start with short periods of time, a few times a day while your baby is awake, and increase the duration as your baby gets older and stronger. The safest place for your baby to sleep is in a crib, bassinet or cradle that meets current Canadian regulations, in your room, for the first 6 months of life. The sleeping surface must be firm and flat. All you need in your baby’s crib is a firm mattress with a fitted sheet. The mattress should fit the crib snugly. The crib should be free of toys, clutter, loose bedding, pillows, comforters, duvets, stuffed animals, bumper pads, positioners and other soft objects. All your baby needs to sleep is a one-piece sleeper. Keep your baby warm, but not hot, and keep their head uncovered while sleeping. Baby seats, swings, bouncers, strollers, playpens, slings and car seats are not safe substitutes for a crib. If you are travelling, be sure to provide a safe sleep environment at all times for your baby. Playpens, adult beds and car seats are not safe alternatives for your baby to sleep in when travelling, and are not designed for unsupervised sleep. Place your baby to sleep in a crib next to your bed for the first 6 months of his life. 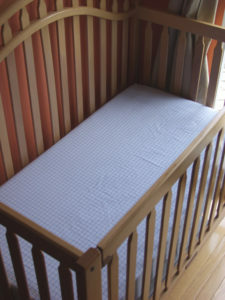 Having the crib next to your bed also helps with breastfeeding during the night. Sharing a sleeping surface with your infant, also called bed sharing, increases the risk of SIDS. It also increases the risk of accidental death. Adult beds, sofas and other soft sleeping surfaces are not designed with your baby’s safety in mind. 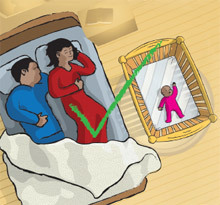 the baby is placed to sleep on a sofa, beanbag, waterbed or sagging mattress. 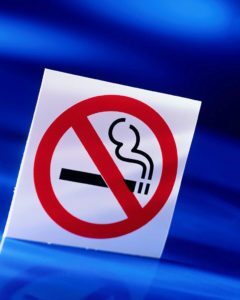 Smoking during pregnancy and after your baby is born is one of the greatest risk factors for SIDS. Avoid both smoking and second-hand smoke during your pregnancy, and keep your baby away from tobacco smoke at all times after he/she is born. Make your home and your vehicle smoke-free and don’t allow anyone to smoke close to your baby or anywhere your baby spends time. Breastfeeding is recommended for the first 6 months of life. Women who are able to breastfeed are encouraged to breastfeed as long as they can. Any amount of breastfeeding for any duration can help lower the risk of SIDS. You can bring your baby into bed to breastfeed. However, return your infant to his/her crib, cradle or bassinet after the feeding.